Phosphoribosylglycinamide synthetase catalyses the second step in the de novo biosynthesis of purine. The reaction catalysed by Phosphoribosylglycinamide synthetase is the ATP- dependent addition of 5-phosphoribosylamine to glycine to form 5'phosphoribosylglycinamide. 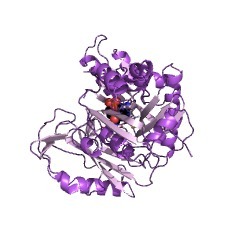 This domain is related to the ATP-grasp domain of biotin carboxylase/carbamoyl phosphate synthetase (Pfam PF02786). There are 22753 GARS_A domains in 22745 proteins in SMART's nrdb database. Taxonomic distribution of proteins containing GARS_A domain. This tree includes only several representative species. The complete taxonomic breakdown of all proteins with GARS_A domain is also avaliable. Click on the protein counts, or double click on taxonomic names to display all proteins containing GARS_A domain in the selected taxonomic class. 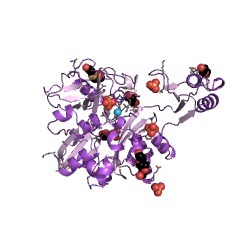 X-ray crystal structure of glycinamide ribonucleotide synthetase from Escherichiacoli. Glycinamide ribonucleotide synthetase (GAR-syn) catalyzes the second step of the de novo purine biosynthetic pathway; the conversion of phosphoribosylamine,glycine, and ATP to glycinamide ribonucleotide (GAR), ADP, and Pi. 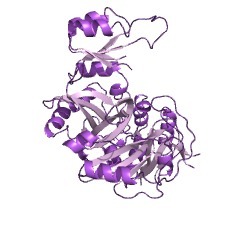 GAR-syncontaining an N-terminal polyhistidine tag was expressed as the SeMetincorporated protein for crystallographic studies. 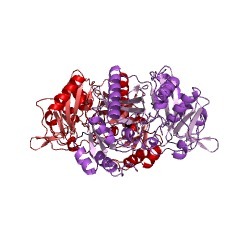 In addition, the protein asisolated contains a Pro294Leu mutation. 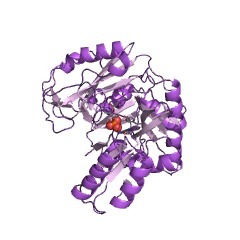 This protein was crystallized, and thestructure solved using multiple-wavelength anomalous diffraction (MAD) phasedetermination and refined to 1.6 A resolution. GAR-syn adopts an alpha/betastructure that consists of four domains labeled N, A, B, and C. The N, A, and Cdomains are clustered to form a large central core structure whereas the smaller B domain is extended outward. Two hinge regions, which might readily facilitateinterdomain movement, connect the B domain and the main core. 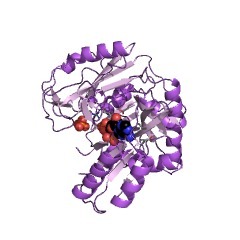 A search ofstructural databases showed that the structure of GAR-syn is similar toD-alanine:D-alanine ligase, biotin carboxylase, and glutathione synthetase,despite low sequence similarity. These four enzymes all utilize similarATP-dependent catalytic mechanisms even though they catalyze different chemicalreactions. Another ATP-binding enzyme with low sequence similarity but unknownfunction, synapsin Ia, was also found to share high structural similarity withGAR-syn. Interestingly, the GAR-syn N domain shows similarity to the N-terminalregion of glycinamide ribonucleotide transformylase and severaldinucleotide-dependent dehydrogenases. 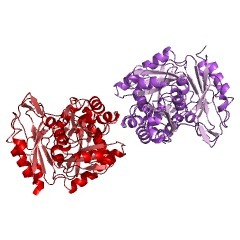 Models of ADP and GAR binding weregenerated based on structure and sequence homology. 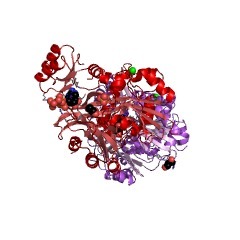 On the basis of these models,the active site lies in a cleft between the large domain and the extended Bdomain. 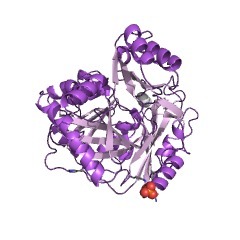 Most of the residues that facilitate ATP binding belong to the A or Bdomains. 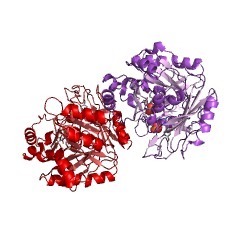 The N and C domains appear to be largely responsible for substratespecificity. The structure of GAR-syn allows modeling studies of possiblechanneling complexes with PPRP amidotransferase. Nucleotide sequence analysis of genes purH and purD involved in the de novopurine nucleotide biosynthesis of Escherichia coli. 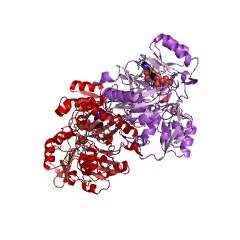 5'-Phosphoribosylglycinamide synthetase (EC 6.3.4.13) and 5'-phosphoribosyl5-aminoimidazole-4-carboxamide transformylase (EC 2.1.2.3) are enzymes involvedin the de novo purine nucleotide synthesis and are encoded by purD and purH genesof Escherichia coli, respectively. A 3535-nucleotide sequence containing thepurHD locus and the upstream region of the rrnE gene was determined. Thissequence specifies two open reading frames, ORF-1 and ORF-2, encoding proteinswith the expected Mr of 57,329 and 46,140, respectively. The plasmids carryingORF-1 complemented not only the mutant cells defective in purH of E. coli butalso the cells of Salmonella typhimurium lacking the activity of IMPcyclohydrolase (EC 3.5.4.10) which catalyzes the conversion of 5'-phosphoribosyl 5-formylaminoimidazole-4-carboxamide to IMP. 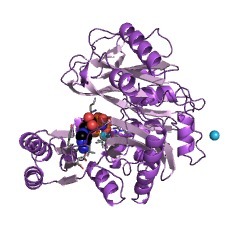 The E. coli purH gene, therefore,specifies bifunctional 5'-phosphoribosyl 5-aminoimidazole-4-carboxamidetransformylase-IMP cyclohydrolase. The plasmids carrying ORF-2 were able tocomplement the mutant cells defective in purD. Both purH and purD genesconstitute a single operon and are coregulated in expression by purines as other purine genes are. A highly conserved 16-nucleotide sequence termed the PUR box(Watanabe, W., Sampei, G., Aiba, A., and Mizobuchi, K. (1989) J. Bacteriol. 171, 198-204; Tiedeman, A.A., Keyhani, J., Kamholz, J., Daum, H. A., III, Gots, J.S., and Smith, J.M. (1989) J. Bacteriol. 171, 205-212) was found in the controlregion of the purHD operon and compared with the sequences of the control regionsof other purine operons. 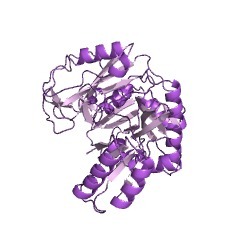 1gso GLYCINAMIDE RIBONUCLEOTIDE SYNTHETASE (GAR-SYN) FROM E. COLI.